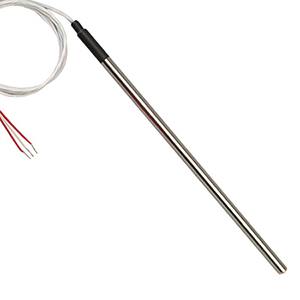 The PRCU sensor can be customized to function like many of our immersion sensor designs such as the PR-10 Immersion Probe, PR-13 Quick Disconnect Probes, PR-12,14,18 or 19 Spring Loaded Probes with Connection Heads. Standard: Specify “-1/4” or “-3/16” for probe diameter in inches. To order intermediate lengths change model number, using the next longer length for price. Over 24", add $1 per inch of probe length. Metric: Specify “-M60” for 6 mm or “-M45” for 4.5 mm for probe diameter. To order intermediate lengths change model number, using the next longer length for price. Over 600 mm, add $1 per 25 mm of probe length. All: To order with shrink tube strain relief, specify “-ST” at the end of the model number. Probes supplied 3-wire standard, 2 and 4-wire may be ordered, consult Sales department for price and availability.